I was a little intimidated when I first opened Lynne Rossetto Kasper's Splendid Table because it is so crammed with historical discursions and antique illustrations that you suspect this might be a book for the library (doesn't everyone have one?) rather than the kitchen. Not so. Kasper writes clear, detailed and elegant recipes for some extremely complicated dishes. 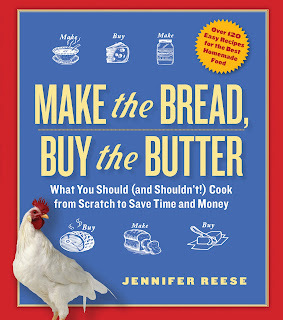 Each recipe includes useful advice for working ahead, buying ingredients, and fitting the dish into a larger menu. Kasper anticipates every question and potential glitch. Do you know how rare this is? Looking through the book just now I was tempted to give it another month as there are dozens more dishes I want to try -- the chestnut tortelli, the risotto of baby artichokes and peas, the wine-basted rabbit. I probably would have put the three "bad" recipes in the "so-so" category if these hadn't been three dishes (dry-yet-damp pork loin, soggy green beans, overpoweringly rich potatoes) that I cooked on Christmas Eve when I wanted to show off. I'm still holding a grudge, but may eventually relent. There were so many more gems: espresso mascarpone semifreddo, the spectacular oven-roasted radicchio, garlic soup Brisighella. I so enjoyed reading your posts on The Splendid Table. Thank you! This is one of the best of the books. Lots of good stuff. Soups, breads, pasta. I think you might have even underrated it a bit, Tipsy. We met once when your oldest was a baby (our husbands were friends in high school). My husband found your blog through the Facebook status update (of course) and turned me to it; I can't wait to read back further. 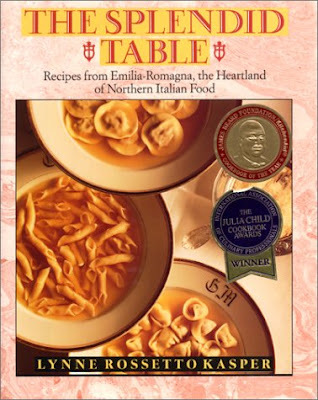 I am working through The Splendid Table's How to Eat Supper right now (in my kitchen and on my blog) and am really enjoying it, though it sounds notably different from the original. I'll have to put the original on my list now too. I'm not the accomplished foodie, let alone food writer, as you, but I aspire. Thanks for the fun posts--can't wait to see more! I also have this book, really like it.